Bicycling is a wonderful way to stay fit and to save money on transportation and is becoming more popular as a recreational activity than ever before. Decatur’s limited access to bike paths and trails forces avid bicycle enthusiasts to include public streets in their routes, however, and this can place them at risk of being injured by distracted drivers. When you have suffered bodily harm due to an accident, it is important to know your rights and to seek compensation for the cost of your medical treatment. The Decatur bicycle accident attorneys of Rosenfeld Injury Lawyers LLC are prepared to answer any questions you have and to protect your interests if you have been hurt. Our attorneys handle Decatur bike accident cases on a contingency fee bases-- meaning you never need to pay a legal fee unless there is a monetary recovery. There are paths and trails available in Decatur to those who seek an off road experience when riding their bicycles, but the majority of these paths are less than two miles long and not suitable for the more experienced rider who wishes to enjoy a longer ride. For this reason, many of the routes chosen utilize city streets and bikers must be careful to abide by the Illinois Rules of the Road in order to prevent accidents. Chapter 11, Article 15 of the Illinois Vehicle Code specifies the responsibilities of bicyclists. 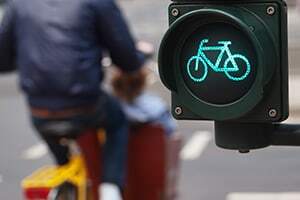 Bicyclists are afforded all of the same rights on public roads as motor vehicles, but must also adhere to the same set of laws. When making a turn, you must first signal your intention to turn and move into the appropriate lane for your turn. Carrying passengers on your bicycle is strictly prohibited as it poses a risk of injury to both your passenger and yourself. Unless preparing to make a left turn, you must always remain as far to the right as safely possible. The only other exception is if you intend to move straight through an intersection which has a right turn lane. You must equip your bicycle with a headlamp and rear reflector when riding at night so that motorists can see you. You are responsible for making sure that your child also follows the laws and may be subject to a fine if you knowingly allow a child to break traffic laws. While there is not an abundance of bike trails throughout Decatur, if you are seeking an adventure or do not wish to ride alone, you may consider joining the Decatur Bicycle Club. Members schedule daily rides and longer trips over the weekends and there are plenty of rides for families to participate in. Bicycle accidents are often the result of careless or reckless driving due to motorists operating a vehicle while distracted, failing to notice bicyclists or not recognizing the rights that cyclists have while on public roads. Vehicles are becoming equipped with innovative technologies to protect passengers, but such technologies are not available to protect bicyclists, who are exposed to their surroundings. For this reason, injuries to cyclists are more severe and may require both immediate treatment and a long term treatment plan. Common bicycle accident injuries include the following. Compound fractures and shattered bones. Injuries to the neck, spine and back. Deep cuts and abrasions from glass, metal or contact with the pavement. Neurological disorders resulting from undiagnosed trauma to the brain. If you have been injured due to another person’s carelessness, the last thing you need is the accumulation of medical bills, especially if you are unable to work during your recovery. The Decatur bike accident attorneys of Rosenfeld Injury Lawyers LLC have been able to recover compensation for hundreds of clients so that they could focus on their physical recovery rather than worry about another financial burden. Contact us now to schedule a free consultation so that we can evaluate your case and let you know more about the legal options that are available to you. We won’t ever expect payment unless we are able to recover compensation on your behalf, so our services come with no risk at all.